The pSB1C3_001 is a new variant provided by the iGEM team Freiburg_Bioware 2010. It was created in process to modify the existing pSB1C3 in order to make it compatible to the "Virus Construction Kit" which requires additional single-cutting restriction enzymes (SspI, SalI, BamHI, PvuII) to insert loop motifs. To fulfill iGEM requirements, all plasmids need to be submitted in pSB1C3. Therefore, primers were ordered for amplifying RepVP123 containing all modifications done so far by PCR and cloning them into pSB1C3. Still, pSB1C3 contains two restriction sites for SspI and PvuII restriction enzymes in its CAT marker. Since these are necessary for cloning ViralBricks in this vector, the iGEM Team Freiburg_Bioware 2010 decided in agreement with iGEM Headquarters to implement a new standard for the pSB1C3 backbone which was named pSB1C3_001. Both restriction sites interfering with ViralBrick insertions were mutated to make SspI and PvuII single-cutters (see method development). Figure 1 Comparison of pSB1C3 (upper row) and pSB1C3_001 (lower row). Deletions of SspI and PvuII are marked by red boxes. RepVP123 containing both rep and cap synthetic gene fragments including the re-mutation of KpnI and the downstream p5TATA-less promotor was cloned into the newly constructed pSB1C3_001. Testing this newly assembled plasmid in cell culture revealed unexpected data: Not only did the newly assembled plasmid work (see Figure 2), but in comparison to pAAV containing the same RepVP123 construct, pSB1C3_001 showed an about 3 times higher transduction efficiency. Although exact reasons are still unknown, these results are probably related to the length reduction of pSB1C3_001 compared to the original pAAV plasmid of approximately 1000 base pairs. 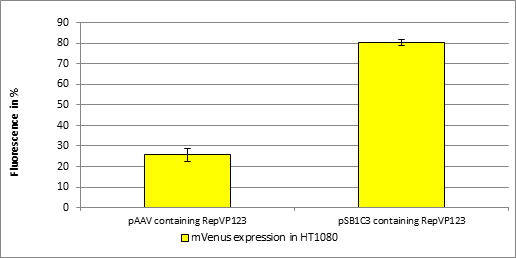 Figure 2 AAV-293 cells were transfected with three plasmids pHelper, pSB1C3_001_[AAV2]-Rep-VP123_p5-TATAless or pAAV_RC_IRCK and pSB1C3_[AAV2]-left-ITR_pCMV_beta-globin_mVenus_hGH_[AAV2]-right-ITR providing essential genes and proteins for producing viral particles. 48 hours post transfection, viral particles were harvested by freeze-thaw lysis and centrifugation followed by HT1080 transduction. mVenus expression of viral genomes was determined by flow cytometry analysis 24 hours post infection. Fluorescence is measured in surviving cells. Results showed functionality of RepVP123 within the pSB1C3_001 vector and additionally increased transduction efficiency.